Brush up on all the details surrounding this bargain bathroom rehab option. Gone are the days when your only option for refreshing dingy, dated, or plain-Jane bathroom tile was to rip it out and replace it. Today, commercial paints formulated for use on tile make it possible to restore the look of your tile floors, walls, and other bathroom surfaces—or lend them a new one altogether—with little more than a can! Simple as it sounds, painting bathroom tile shouldn’t start without first evaluating key project considerations and constraints. Below, we’ve outlined the six things to know before you even pick out a paint color. Painting bathroom tile is much cheaper than retiling. You’ve heard it before: Paint is an economical material. Unsurprisingly, then, it’s the most budget-friendly way to refresh bathroom tile that isn’t cracked, crumbling, or otherwise structurally compromised. Frugal do-it-yourselfers can spend as little as $100 to paint 100 square feet. Meanwhile, depending on the tile material, a DIY retiling can cost anywhere from $100 to $1,500 for a typical bathroom floor measuring 35 to 100 square feet. Retiling a tub surround or walls of a shower stall between 9 and 13 square feet, too? That’d be another $400 to $1,300, according to the online planning tool, CostHelper.com. Solid-colored tile in bargain materials like ceramic falls at the lower end of these price ranges, while patterned tile in premium materials like marble falls at the higher end—as much as 15 times the cost! Patterns in painted tile floors, on the other hand, would only cost you double or triple the expenses for materials (depending on how many colors) and time. Popular bathroom tile materials—ceramic, porcelain (a subset of ceramic tile), natural stone (marble, travertine, slate, granite, or limestone), and quarry tile—are sold in a number of solid colors or patterns. Still, those preset styles might not suit the design of your bathroom, go out of fashion after you’ve installed them, or, be simply too cost-prohibitive to install. With paint, you can lighten, darken, or apply a pattern of your own design to your tile to fit any bathroom aesthetic, from a retro checkerboard pattern to a cool and contemporary geometric design. And, should your style change in three years, you can easily repaint. Keep in mind that brighter paint colors are a better option for space-limited bathrooms; darker paint absorbs light and can have the effect of making a small bath look more constricted. It’s not practical to paint tile on all bathroom surfaces. With the exception of glazed quarry tile (which doesn’t bond well with paint), you can apply paint to most popular types of tile: ceramic, porcelain, natural stone, or even un-glazed quarry tile. 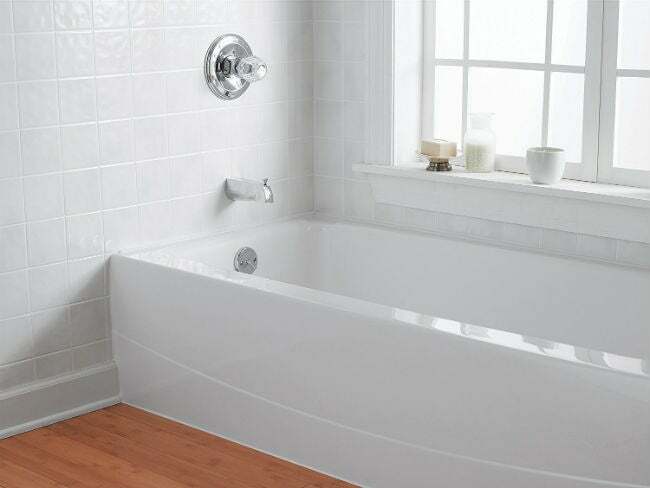 But your paint job will last the longest on tiled bathroom surfaces that receive low to moderate exposure to moisture—think bathroom floors (outside the immediate vicinity of the tub), walls, and backsplashes. Tiled countertops, tub surrounds, or shower surfaces, while paintable, aren’t as practical surfaces for this treatment in the long-term because the paint is more likely to prematurely fade, peel, or blister with regular exposure to water. That said, if you are on board for frequent touch-ups or re-application until your budget allows for a full bathroom remodel, this fix might be just the ticket! 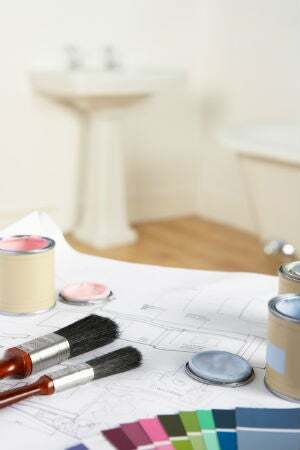 It’s crucial to pick a paint that’s right for the tile material and bathroom surface. Ceramic, porcelain, and unglazed quarry tile can take either latex or epoxy paint in one-part (pre-mixed) or two-part (ready-to-mix) varieties formulated for interior use. Latex paint ($10 to $30 per gallon) is generally less smelly and toxic. Unless you choose a pricier mildew-proof variety, though, it readily weathers with heavy moisture exposure and therefore should be saved for bathroom floors or walls. For the “splash zones” of backsplashes, countertops, tub surrounds, and shower surfaces, epoxy paint ($20 to $35 per gallon) does the trick. This type of paint cures into a harder, more durable coat that boasts more resistance to moisture, heat, and everyday wear-and-tear than its latex counterpart. You might look for a well-reviewed two-part epoxy specifically designed for specifically for tubs and tiles, like this Rust-Oleum refinishing kit that’s been reviewed nearly 2,000 times (available on Amazon). Natural stone tiles, on the other hand, need an acrylic latex paint formulated for interior masonry or stucco ($20 to $35 per gallon). All of these paints come in a full spectrum of sheens ranging from flat to high-gloss. The glossier the finish, the more slippery the painted tile will be. Flat and matte sheens afford the most traction underfoot, while semi-gloss and high-gloss sheens offer the least, a disadvantage on already slip-prone surfaces like shower floors. It can put your bathroom out of commission for a weekend or longer. • Surface preparation entails sanding, vacuuming, and then scrubbing the tile and grout lines (with a store-bought cleaner for the tile material, or a homemade solution of one-half cup white vinegar and one gallon of warm water) to remove dirt and grime. • Priming the tile (with epoxy or urethane primer for ceramic or porcelain tile, or masonry primer for natural stone or unglazed quarry tile) is essential to making the tile more receptive to paint. Read and adhere to the primer’s instructions for dry time—you won’t want to cover something that’s sticky. • Painting the bathroom tile can involve either rolling color onto large swaths of tile at a time brushing individual tiles by first “cutting in” around the edges. The latter method would rely on an angled brush and a steady, precise hand in order to avoid sullying grout lines or neighboring tiles, and that can drag out the process. If you’re doing more than a few accent tiles this way, plan accordingly. Then, while the paint dries over the next two or more days, you’ll need to avoid touching or walking on it. • Applying pattern to the fully-cured tiles typically entails taping a store-bought or homemade stencil to the tiles you want to pattern, then rolling over the stencil with a roller cover saturated in the same paint you used for the tile. Again, wait out the full dry time. • Finally, sealing the painted bathroom tile protects your project from grime, scuff marks, and scratches. Your clear sealer (urethane sealer for ceramic or porcelain, or masonry sealer for natural stone or quarry tile) also has a dry time you’ll want to factor into your planning. Only after you’ve waited the full time should you begin to use the bathroom. All in all, you could be looking at a project that puts the bathroom out of order anywhere from two days to several days. And, when you’re thinking about putting fresh paint on floors, you can’t even get away with walking into the bathroom to grab whatever facewash you unintentionally left behind, so be sure to take all the essentials out with you before you start! It doesn’t take much but regular sweeping, vacuuming, and mopping the sealed painted tile with a store-bought or homemade pH-neutral tile cleaner that’s tailored to your tile in order to retain its color and fend off abrasive dirt. However, laying mats in high-traffic areas and floor pads below furnishings on the tile can prevent scuff marks or impressions from marring the paint job. If blemishes do appear in the paint job, simply use an artist’s paintbrush and your leftover paint to make touch-ups, then allow it to dry completely before re-sealing that portion.